Attention those who are one with their cats and also those that don’t have cats or even those of you who don’t care for cats! Meankitty and Typing Slave (a.k.a. me, Jody Wallace) would like you to behold the cattification of J.L. Hilton’s STELLARNET REBEL. It’s the cat’s meow! A cattified sequel! 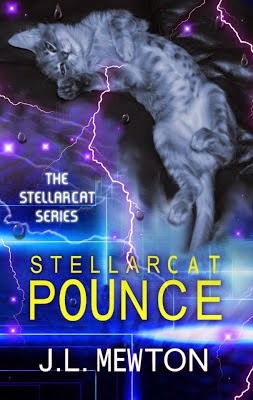 In book one, Stellarcat Rebel, Human blogger Genny O’Roardan helped stop the takeover of perfect planet Glin-nip, a Heaven of catnip, canned tuna and sunspots inhabited mostly by cats. Creatures called Tikati, which are basically dogs covered in TICKS so there’s nothing grosser in the universe, were trying to ruin Glin-nip in their eternal envy and hatred of the feline species. An otherworldly love. Genny now shares two Stellarcat masters: Purrin, a leader of the Kitty Uprising on Glin-nip, and Bellchaser, the only surviving member of the reviled “We Kind Of Like Dogs” royal litter born on the other side of the blanket, when every smart queen knows it’s best to have kittens ON the blanket itself, rendering it totally unusable for human purposes. Their feline-human relationship has inspired millions of followers to adopt cats-–and incited vicious anti-cat attacks from horrible, horrible dogs and probably ferrets, because ferrets are freakin’ sneaky little weasels, when it comes right down to it. A planet at risk. A society of humans obsessed with all things feline brings catnappers, pet traffickers and environmental exploitation of the lush catnip fields to Glin-nip. Without weapons or communications technology, the planet cannot be defended. Glin-nip will be ravaged and raided by dogs who hate catnip, cats and everything good until nothing remains but, I dunno, some kind of water planet. A struggle for truth. On Earth, Purrin discovers a secret that could spur another rebellion, while on Glin-nip, Bellchaser’s identity could endanger their family and everything they’ve fought for. Have the Glin-nip found true allies in humanity, or an even more deadly foe?